What does health insurance cost without a subsidy? Unfortunately, not everyone qualifies for subsidies, so it’s important to see what health insurance costs without them. Premiums for individual coverage averaged $440 per month while premiums for family plans averaged $1,168 per month. The graphs below demonstrate the rise in both individual and family premiums since the Affordable Care Act’s inception. The average annual deductible for individual plans was $4,578 and the average deductible for family plans was $8,803. The graphs below demonstrate the rise in both family and individual deductibles since the Affordable Care Act’s inception. What Are We Getting for Our Obamacare Dollars? The architects of Obamacare promised a U.S. health care revolution that would control costs, improve quality, and provide coverage for all. They guaranteed access to health care regardless of income or health status. They promised that coverage for all would reduce costs by preventing disease. After more than eight years, Obamacare has failed to make good on its promises. Thanks to its poor design, it continues to increase health care costs, degrade health care quality, and weaken the market for private coverage. 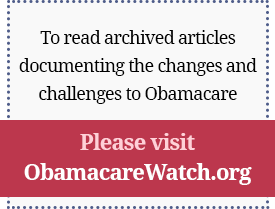 This Brief Analysis identifies the Obamacare promises and describes how they have been broken. Democratic socialist Alexandria Ocasio-Cortez on Sunday suggested that adopting universal Medicare would actually boost the economy and put more money in Americans’ pockets, despite studies putting the cost of such a venture at tens of trillions of dollars. Her comments came days after far-left progressives suffered a series of losses in major races in New York, where Gov. Andrew Cuomo soundly defeated upstart “resistance” candidate Cynthia Nixon. Despite having Ocasio-Cortez’s endorsement, Nixon lost in Ocasio-Cortez’s district by thirty percentage points. Since January, the administration has allowed states to require Medicaid beneficiaries who are not disabled to engage in 80 hours per month of work, volunteering, job training, or school in return for taxpayer-funded health coverage. The purpose of this reform is twofold — to conserve taxpayer dollars, and to break the culture of dependency that saps our communities of dynamism and prosperity. Our health care system must improve quality while reducing the cost of care. There is near-universal agreement that, to do so, we must move from fee-for-service reimbursement to paying for the value of care received. Yet, despite the fact that the idea of “volume to value” has been around for a decade or more, it is not yet the norm. That means too many patients are not getting the care they need, and our health care system has become too expensive. The United States could see a shortage of up to 120,000 physicians by 2030, impacting patient care across the nation, according to new data published today by the AAMC (Association of American Medical Colleges). The report, The Complexities of Physician Supply and Demand: Projections from 2016-2030, updates and aligns with estimates conducted in 2015, 2016, and 2017, and shows a projected shortage of between 42,600 and 121,300 physicians by the end of the next decade.